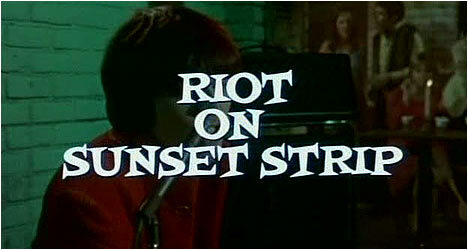 Riot on Sunset Strip (1967) comes courtesy of American International Pictures producer Sam Katzman a.k.a. “King of the Quickies.” He was known for making topical exploitation films often dealing with rebellious youth. This film was shot and released within six weeks of actual teenage curfew rioting that occurred on the Sunset Strip in Los Angeles in December 1966. Early on, the voiceover narration establishes the tone of this film as it solemnly intones, “These are not dangerous revolutionaries in a beleaguered city under marshal law. These are teenagers on the Sunset Strip … Irresponsible, wild, beat, protest youths with nowhere to go, nothing to do, no goal in life.” An elderly gentleman walking along the Strip complains to a police officer about “the riff-raff” and wants something done about it. Cut to a garage band in a nightclub jamming out to a protest song of some sort about how they are being harassed by The Man because they’ve got long hair. “What to do about the youth problem?” asks the omniscient narrator. We meet good girl Andy (Farmer) with her huge 1960’s hair (see Amy Winehouse) and new to a school where several of her classmates convince her (against her better judgment) to go with them to Pandora’s Box, a hep club on the Strip. The club scenes feature groovy garage bands and lingering shots of girls in tight-fitting tops and dresses. The music, provided by the likes The Standells, the Chocolate Watchband and The Enemies, is responsible for the film’s minor cult status. The cops routinely bust longhairs for smoking pot and we see parents bailing their children out of jail with one irate mother admonishing her two daughters, “Look at you two. Compared to you Dracula looked like a fairy princess!” Of course, Andy and her friends get busted by the cops when the leave the club after curfew. They’re hauled into the local police station where we find out that Andy’s estranged father is watch officer Walter Lorimer (Ray). Uh oh! Andy’s a good kid who’s just fallen in with the wrong crowd who really aren’t all that bad. Too bad her mother is a shrieking harpy and a drunk. Riot on the Sunset Strip features hilariously dated “hip” dialogue loaded with words like “groovy” and “boss.” Like most juvenile delinquent films made after the 1950’s, this one lives in the shadow of Rebel Without A Cause (1955), the Citizen Kane (1941) of J.D. films. Riot on the Sunset Strip is the kind of exploitation film that struck fear in the hearts of square parents afraid that their sons or daughters were being corrupted by hippies. The film documents the never-ending generation gap as parents have no clue what their kids are doing or why. Interestingly, there is a scene where the storeowners on the Strip argue over what is to be done about these wild youths with the older merchants butting heads with the club owners and Walt sticking up for the kids. This film is an amusing snapshot of the times in which it was made with a ripped from the headlines story.